Very glossy and easy to apply! Do you want jet black tires with an extra long lasting shine? 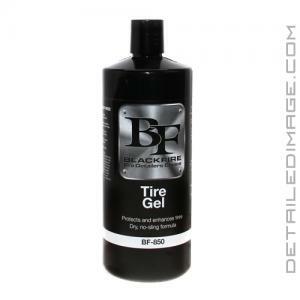 If so, the Blackfire Tire Gel (Formerly know as the Total Eclipse Tire Gel) is the answer to your tire dressing needs. One application gives you a very dark and glossy appearance. It is designed to make your tires look rich and bold so they are sure to catch the eye. The gel based formula is a bit thicker so it doesn't run down your tires, it stays right where you put it. You can expect the formula to cling to your tires, thus providing a longer lasting shine that won't sling on to the paint. This means you'll be seeing this shine for weeks to come and it won't run off with one rain fall. Best of all this long lasting formula is good for your tires and the environment, so it's totally safe to use unlike many other dressings that will actually harm your tires and wheels in the long run. It contains UV inhibitors that help prevent fading from UV rays and it utilizes none of the harsh ingredients found in older dressings. This water based formula is solvent free so you can be sure you are providing your tires optimal care. Take the shine of your tires to the next level with the Blackfire Tire Gel. Contains UV inhibitors to prevent fading and cracking. Feels dry to touch and does not sling. First coat provides a natural rubber finish. Second coat provides high gloss finish. DIRECTIONS: Apply to clean tires. Apply a thin strip of Total Eclipse Tire Gel onto tire applicator and work into tires. Remove any excess with a microfiber towel. If you desire additional gloss apply a second coat five minute after first coat. One of the best looking and safest tire gels out there. By far and away, this is the best tire dressing you can buy. I applied to Goodyear LS2 tires and the application was smooth and even. The second coat is for a deeper, blacker look, which I always do on black cars. The gel smells like cough syrup, and a single 4" bead is ample for coverage on 18" tires. I have been disappointed with tire gels from Optimum and Chemical guys. Even though Blackfire looks and sounds like something stocked at a cheapo auto parts chain, this is the king of tire gels. The second coat doesn't look shiny or greasy, it simply makes the tires look nice and black. A single coat makes the tires look clean. Don't waste you time and money on other tire gels, start and end with this one.